Enabling works have been postponed for the innovative Sheffield-Rotherham tram-train service that is scheduled to reach the borough later this year. New vehicles will eventually run as tram-trains between Sheffield city centre and Parkgate via Meadowhall South and Rotherham town centre. For now, they are being used on the existing Supertram network in Sheffield. 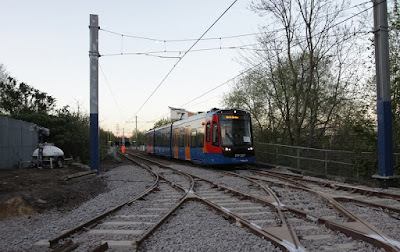 Already delayed as Network Rail struggles to get to grips with the upgrades needed to the heavy rail sections of the route, work was scheduled to be carried out in the Tinsley area this weekend to connect the Supertram and Network Rail overhead power lines. Buses were set to replace trams between Meadowhall and Valley Centretainment. An update from Stagecoach, the operator of the Supertram service now states that: "Due to the contractor not receiving vital components from the supplier, the overhead power line work at Tinsley planned for the 24th and 25th February 2018 will no longer take place. A normal service will now operate on all routes on these dates, and work will be rescheduled for a later date." Last month, Carillion, Network Rail's lead contractor on the project, entered compulsory liquidation. Earlier this month, Stagecoach was forced to withdraw the new vehicles from its network in Sheffield after a "problem" with one of the new Citylink vehicles near Shalesmoor. The operator said: "As safety is our top priority, a decision has been made to temporarily withdraw these trams from service while the issue is investigated. We are working with the manufacturer to identify and rectify the problem." The Government's Public Accounts Committee looked at the issues of cost increases and delays, the under-estimation of the scale and complexity of the works, and the risks involved in delivering new technology. It said that it had all the makings of a "how not to" seminar for future projects. First mentioned in 2009, a revised construction programme will see infrastructure complete during Summer 2018.